"Your treasure house is in yourself. It contains all you'll ever need." Verily, oneself is the Eye, the Endless Eye." There is much controversy about the devotion of Disciples who follow Gurus, or any who speak of Surrender and servitude to the Diety of their choice. Even more confusing, debatable and intriguing is the phenomena of those who can "Love All People" while expecting no love in return! Crazy! Not possible! Or is it? Do those people you see emitting Kindness all over the place and returning impatience and impertinence with sweetness actually feel that way?? The reality is that when one is in a loving manner, it's so much more relaxing and fulfilling. Try Observing yourself on these two extremes and note the Truth of it for you. Which brings about the point I was sidling up to; one that may be even more unbelievable than the first postulation: When we pour Loving Kindness...Compassion...let's call it AMIABILITY into the world; we create clones of our Amiable Selves. We inspire others. We support them in their efforts to get a footing into ways more pleasurable and satisfactory. We promote change through our consistency and attention to how we are treating ourselves and others in the world. And, our World...the Earth Herself. In the ordinary paradigm, this sounds like weakness. In an expanded view, it becomes obvious that a great strength is needed, and indeed accumulates and becomes stable, in our personality and our Being when we practice this. "Become like a mountain," centered in your cradle of love...real love; compassion. Downright at Peace with the World. Rooted in it, for the ages. Like a mountain. Just the right amount of dynamite can blow the mountain up...or more realistically, part of the mountain. So too, the anger humans habitually explode with...leaving them fragmented, broken; partly broken: separated from the peaceful center of their Being, just like a mountain turned to rubble. Therefore, we need to remain "like a mountain" in our loving nature. Attentive, consistent and steady in reviewing our motives and reactions. In this way, like the mountain, we cultivate our Root in Compassion. We become Uplifters in the world, instead of tearing down the good things we want to build and achieve. We need to remember that each little explosion of negativity we allow to go unremedied is another chunk out of our Mountain. With this practice we begin to see how the Devotee can remain in their devotion. This is not to say we should repress our anger or dismay about injustices we see..."We need our anger," Laura said. I agree. We need it as a wake up call...as long as we process it, and act consciously from it, rather than spewing it out on the world. This page was prompted by the understanding and ongoing reminders that deep, deep down in each person is the remnants of their disappointments or outrage...unless and until the work of transforming those remnants is done. When that is accomplished, we become aligned with being that every-loving person. Thanks for reading. Please send me notes on your experience of this concept and your practice of it. How do I fill my own shoes?? 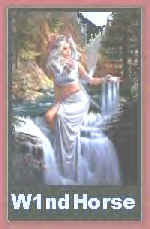 The exquisite painting, "Cascade" used with permission of the Artist, Jonathon Earl Bowser...some years back! Thankyou again, Jonathan! I believe it was WynDHawks that made the logo for me with it. Wyn; where are ya? ?